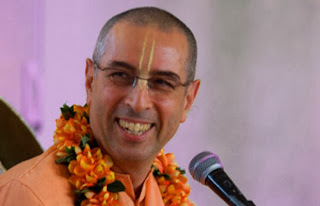 Announcement - Niranjana Swami's Visit to Toronto Indefinitely Postponed ~ The Toronto Hare Krishna Temple! We don't like being the bearer of bad news, however the Toronto Hare Krishna Temple would like to let all of our devotees know that, unfortunately, HH Niranjana Swami's visit to Toronto, which was scheduled for Dec 16-17, 2014 has been indefinitely postponed. Maharaj will not be travelling to Canada as he had been expecting. We apologize for any confusion and hope that our Toronto Hare Krishna community will be able to host Niranjana Swami sometime in the future. Please note that the "Nama Yajna" program, which was scheduled to be held on Tuesday, December 17th, is now cancelled. Hare Krishna!